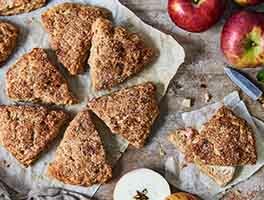 Golden raisins are the featured fruit in these tender, tasty scones, made with good-for-you white whole wheat. With less sugar than most scones, these rely on dried fruit for their sweetness. Substitute chopped dried apricots, chopped dried dates, or the dried fruit of your choice for the raisins and/or the nuts; use a generous 2 cups of whatever fruit/nut combination you choose. In a medium-sized mixing bowl, whisk together the flour, baking powder, baking soda, salt, and sugar. Cut the butter into pats, and work it into the dry ingredients to make an unevenly crumbly mixture. Stir in the fruit/nuts. Whisk together the orange juice, milk or half & half, vanilla, and eggs. Reserve out 1 tablespoon of the mixture, then add the remainder to the dry ingredients all at once, mixing just until the dough comes together. Using a scone or muffin scoop or a 1/4-cup measure, drop the dough by 1/4-cupfuls onto the prepared baking sheet, leaving about 1 1/2" between the scones. Brush with the reserved 1 tablespoon of the milk mixture, and sprinkle the tops with coarse white sugar. Bake the scones for 20 to 22 minutes, until they're starting to brown on top. Remove them from the oven, and serve warm, with jam and butter; or with fruit curd and English clotted cream or double Devon cream. 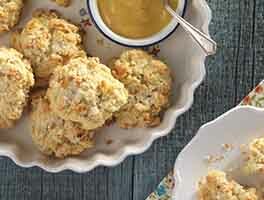 To serve later, reheat scones, wrapped loosely in aluminum foil, for 8 to 10 minutes in a 350°F oven. 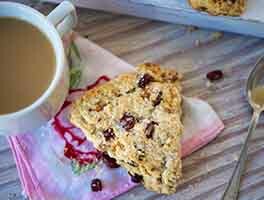 If you have a classic 8-wedge scone pan to make wedge-shaped scones, this recipe fills the pan perfectly. These are very good healthy-tasting alternatives to regular scones. I used the white whole wheat flour and substituted craisins for the raisins. Delicious with fruit spread or jam. I may have screwed something up, because my experience was SO different than the other reviews on this site-but I don't know what! The only substitution was cranberries instead of raisins. My scones came out dense and tasted as though there was no sugar in them whatsoever. Very disappointing. We're sorry this didn't work out for you but a baker can probably help troubleshoot for next time! Give the Hotline a call at 1-855-371-2253! I modified the recipe a bit using what I've learned from other KAF scone recipes. I incorporated the butter into the flour mixture before adding the raisins and nuts, I can't imagine getting the butter to integrate with the flour with big chunks of raisins and nuts in there. After bringing it all together I stashed it in the fridge for a good 20 minutes before baking. In my limited scone-making experience this makes a big difference in getting light, flaky scones. I did modify the ingredients to make it a bit healthier. I used half oat flour and half white whole wheat, and instead of brown sugar I used maple syrup (which I added to the liquid ingredients, of course). And I used fiori di sicilia for 1/4 tsp of the vanilla extract. If you're unfamiliar with King Arthur's fiori di sicilia you're missing out. Its lemon-orange notes were lovely in this recipe. They turned out great. They were light and flaky, as I like my scones to be (if I wanted a moist muffin I'd make muffins!). I topped them with just a bit of lower-in-sugar cream cheese frosting. Absolutely wonderful. This was my first attempt at baking scones, and it certainly won't be my last. I used Splenda Brown Sugar substitute in place of the brown sugar, Smart Balance 50/50 Butter Blend in place of the butter, and topped with a tiny bit of Turbinado Sugar... trying to keep this as close to South Beach Diet friendly as possible. They were fabulous! 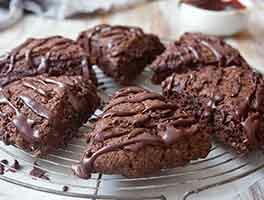 This will be a great addition to the breads and sweets that my health-conscious friends, family and I will be able to enjoy through the holidays and beyond. 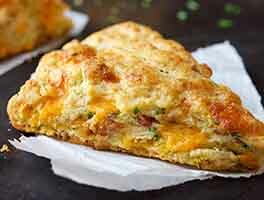 Made these this morning and they have a perfect crumb and very moist--not like those dry Starbucks scones! Left out the raisins and nuts since I wanted them to be more biscuit-like. I just made the dough into a ball directly on the baking sheet, flattened it with my hands, then cut it into 8 pie-shaped pieces, spread them out on the baking sheet so they weren't touching each other, and they were ready in 15 minutes. Served with freshly-made blackberry topping. Yum! This came out really great. I didn't use brown sugar or white whole wheat flour because I didn't have them on hand, but my husband said these were the best scones I've ever made. He said they were light and flaky, and they were not too sweet. :) I thought that was a lovely compliment. I will definitely make these again. I used natural cane sugar, and organic white flour. I also accidentally used 1/2 cup butter instead of 1/3, which may have explained it being lighter than usual. I think I just might keep using 1/2 cup butter. Really delicious made as directed!